Living things are cool. As an academic with a PhD in medical physiology who spends most of his time teaching anatomy and physiology to future health professionals, I am constantly reminded of this fact. Living things in water are even cooler. As a researcher with an MSc in marine biology and a long career spent exploring how aquatic organisms function in the marine environment, I am constantly amazed and excited by every new discovery, however mundane. Over the course of my career I have been trying to combine the two fields by focusing on the application of physiology in the service of fisheries. In other words, if we are going to both exploit and protect marine resources, we have to better understand the basic biology of the organisms and their role in the ecosystem. I would love to say that I have always felt a calling to do this, but sadly not. As a child of diplomats I grew up in exotic locations around the world, which facilitated exposure to a wide array of cultures. The experiences of my youth left me interested in a variety of topics; science, and specifically marine biology, was just one of them. The one common thread that I did not identify until much later in life was my fundamental love of water. There has always been an unmistakable primordial connection; if there was a creek, lake, or ocean in the vicinity, I was in it. Swimming, fishing, canoeing, sailing – I loved them all. The fact that maybe I could make a living by studying living things in the water seemed like a very attractive way to spend my life. 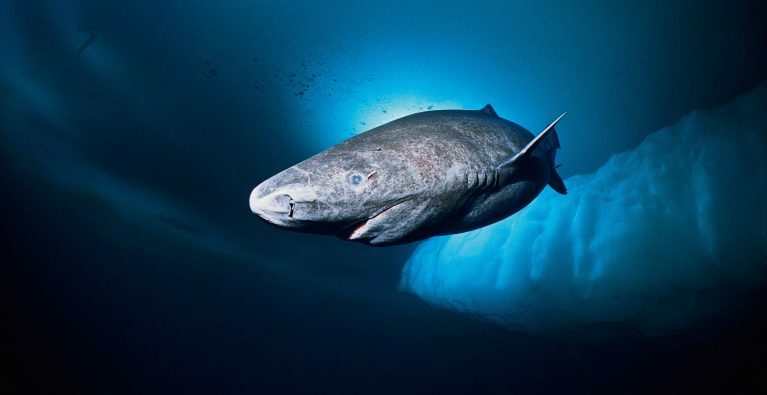 An opportunity to research lemon sharks in Florida launched my postgraduate career and subsequently led to various studies involving animals, which have included tunas, marlin, sandbar sharks, bar-headed geese, Gippsland giant earthworms, leatherback sea turtles, Arctic cod, haemoglobin-less icefish – and now Greenland sharks.